As you're thinking of college supplies for your college dorm checklist, there may be some things that you never considered. There may be dorm essentials you didn't consider because you probably didn't even think that you needed them! One of the things you may not realize about your college dorm room is the dorm flooring isn't going to be cushioned dorm carpet. Your college dorm floor is going to be cold, hard linoleum. You don't want to step on cold linoleum every morning when your dorm alarm clock goes off! 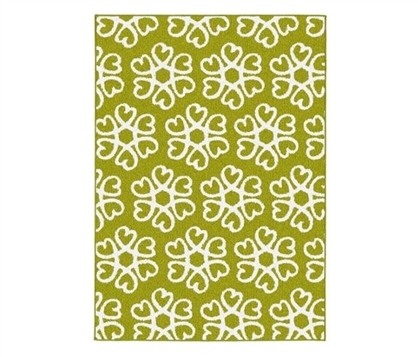 Add a dorm rug like our Hearts Blossom Dorm Rug in Lime Green and White to your college supplies! 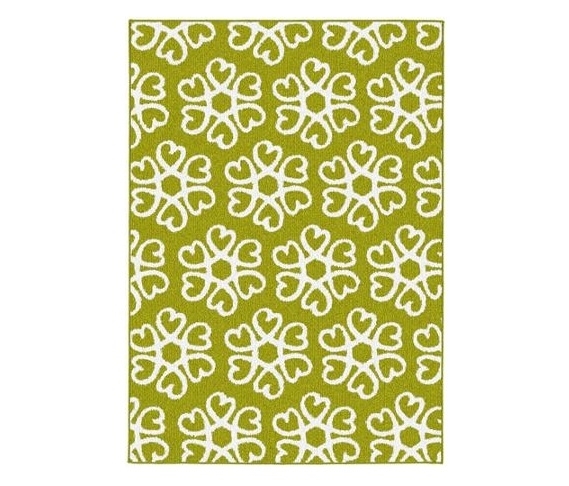 Our Hearts Blossom Rug in Lime Green and White is going to add both warmth and style to your college dorm room decorations. You won't have to worry about stepping onto a cold floor in the morning and you will also complete your college dorm room decor. Featuring a white heart pattern in the shape of flowers on a lime green background, you can add a pop of bright color to your dorm necessities. Plus when your friends come over to visit, you don't have to worry about your friends sitting on a cold dorm floor - they can sit on your dorm rug and with the simple addition of a dorm bedrest, you'll be able to hang out with your friends in comfort and style!